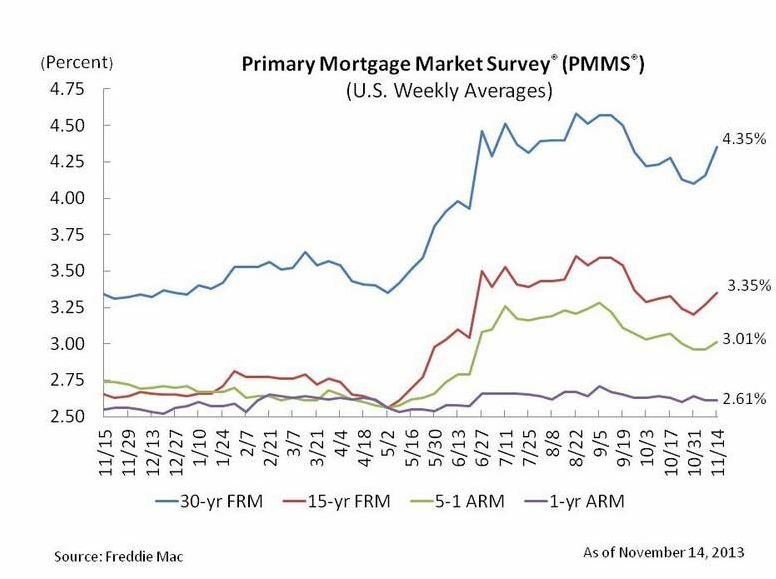 30-year fixed-rate mortgage (FRM) averaged 4.35% with an average 0.7 point for the week ending November 14, 2013, up from last week when it averaged 4.16%. A year ago at this time, the 30-year FRM averaged 3.34%. 15-year FRM this week averaged 3.35% with an average 0.7 point, up from last week when it averaged 3.27%. A year ago at this time, the 15-year FRM averaged 2.65%. 5-year Treasury-indexed hybrid adjustable-rate mortgage (ARM) averaged 3.01% this week with an average 0.4 point, up from last week when it averaged 2.96%. A year ago, the 5-year ARM averaged 2.74%. 1-year Treasury-indexed ARM averaged 2.61% this week with an average 0.4 point, unchanged from last week. At this time last year, the 1-year ARM averaged 2.55%. As always, Frank Nothaft, vice president and chief economist from Freddie Mac, provided us with some valuable insight. There you have it. Despite average rates increasing, rates are still unbelievably low. That’s why you need to act now. We’ve got low rates that you need to take advantage of right this very second. If you’re looking to refinance or get a new mortgage, don’t miss out on these great low rates! Call us today! ← Should I Choose a Walkable Community or Suburban Community?